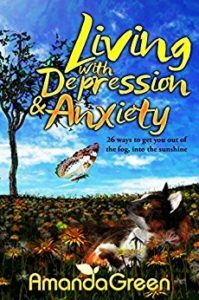 Living with Depression & Anxiety has been written by Amanda Green* as a self-help book for anyone suffering from these mental health problems. But I would suggest it is a book everyone should read. Most of us will have suffered occasional spells of anxiety and stress, but perhaps not the completely debilitating thick fog, or the Black Dog as Winston Churchill called it, that envelopes people for long periods, often for no discernable reason. It is often hard for the rest of us to understand exactly what that person is going through and how we can best help them. Sometimes, particulraly when externally their life seems quite blessed, it is very easy for family, friends and colleagues to suggest they “buck themselves up!” As Amanda explains, that sort of approach causes more harm than good. And it can often stop those suffering with mental illness from being honest about their situation and getting the help and support they need. “ When depression takes hold it can be difficult to concentrate and process complex information. This book is written in simple but effective language and organised into short sections full of practical tips, making it, in my opinion a great tool when mental health is a challenge. “26 ways to get you out of the fog and into the sunshine,” which is essentially an A-Z of coping skills. Amanda starts by describing the symptons of depression. At one end, this could be the sort of depression which makes you feel low, but doesn’t necessarily impact on day to day activities. At the other end, people can no longer function properly and may even attempt suicide. Throughout this little book, Amanda continues to talk about her experieinces, the highs and the lows. She talks about the self-help steps she has taken that work for her: advice that will help anyone suffering and also help those on the sidelines better understand. One of her tips is to write down things that make you happy. Amanda provides her own list. If you suffer from anxiety or depression, you should get this book. If you know anyone who suffers from anxiety of depression, you shoud get this book. And on the basis that you are likely to be one or the other at some time in your life or, maybe both, just get this book.